Mirrored sunnies have been a trend for a while and with their dazzling, rainbow-like colourful lenses and massive endorsements from an army of celebrities, it looks like it’s a trend that is going to stay for a little longer. Nowadays with the perfect pair of mirrored sunglasses, you can dress up or pare down an off-duty look, adding just the right amount of pizazz to your outfit no matter what the occasion. First on our list are the Ray-Ban RB 3025 Aviator Flash Lenses . We love the way Kourtney Kardashian introduces a pop of colour to her polished, all black ensemble with her pair and they are a fab update to the classic, pilot shape. We’re also equally in love with this retro model(also available in a polarized version). They’re very reminiscent of John Lennon and are throwback to the style of earlier generations. Alessandra Ambrosio delivers an A-List off duty look with her frames and Gigi Hadid also shows off her sassy style, teaming her Ray-Ban Round Flash Lenses with a summer dressy, cool sneakers and a funky blue Balenciaga bag. We promise that this is our last selection from the Ray-Ban team but our list would not be complete without showing you these Flash Wayfarer. Even more impressive is that they are now in a foldable version which mean you can pop them into the tiniest of places. Perfect! We love the way Chiara Ferragni has styles her pair. Just in time, before we bore you to death with our Ray-Ban obsession is the Carrera 6000 MT . These sporty shades are another celeb favourite and you’ll definitely be kicking it with these fantastic mirrored shades and the pill-shaped logo adornment on the bridge. The sunglasses have all the classic features you’d expect from a Carrera design. They are sleek, funky but they have an added feature… they are also foldable. The frames are foldable at three points, in the middle of the temple pieces and at the centre. We know, we know, you can also get the Ray-Ban Folding Flash Lenses.. but why not add two pairs of mirrored glasses to your troop? We’ve saved the best until last and to round off our list are these delectable pair – the Fendi 0041/S Iridia sunglasses. We’ve spotted them on an endless list of bloggers, fashion personalites, actresses… you name it… they’ve all been spotted in a pair of these diamond encrusted, cat eye shaped frames. Check out Cara Delvigne and Lily Allen rocking a pair. 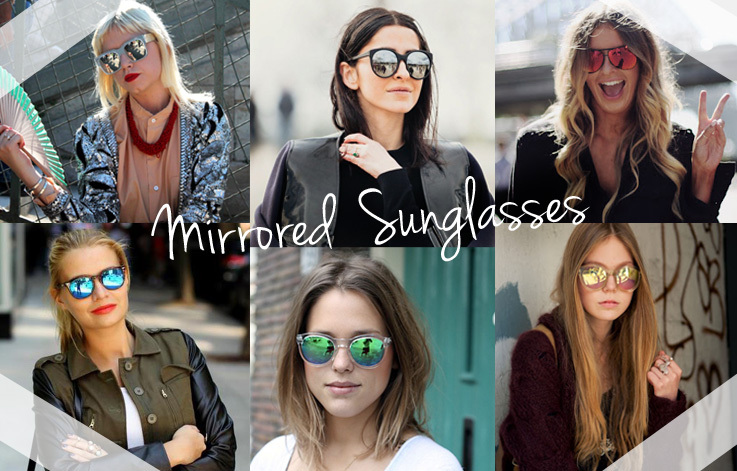 Still not convinced on mirrored sunglasses? Check out our site and get some inspiration in no time.